Larry Harney, Irish Bog Oak Sculptures. Over 4000 years in the Making. Every One of My Sculptures is Special and Unique. There is Nothing More Irish than a Bog Oak Sculpture. Every one of my sculptures is unique and special to me. "When I work, and in my art, I hold hands with God"
Formed over four to seven thousand years, bog oak has been concealed and preserved by Ireland’s bogs since before the Pyramids of Egypt. Larry Harney works from his studio in Co. Kildare, Ireland, where he spends countless hours working with this precious material to create sculptures of beauty and substance. Every single one of his bog oak sculptures is unique and very special to him. He is very grateful and thankful to God when he has completed a piece. Larry does not use templates – He follows nature’s lead and fashion the shapes that nature itself has formed over thousands of years. 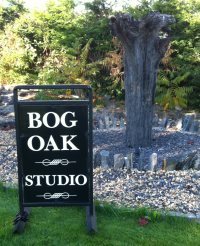 A Bog Oak Sculpture is a very special and rare gift – Something uniquely Irish and tied to Ireland’s landscape and heritage.